From my first pay check when I was 19. 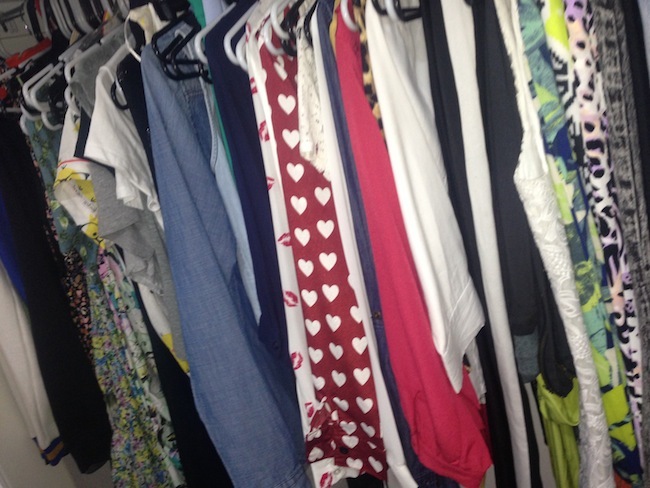 Every week there would be a new item or two added to my closet… that was on a tamed week. I remember sitting in the office with my best friend the amount of items we would order would not be normal. Adding to your cart is dangerous. The power of online shopping and a good SALE sign in the shops had flooded my room! I have moved houses 4 times in the last few years and my closet has gotten smaller and smaller… but I took everything with me!! I blame my family on being to selfish to give me the master bedroom.. Emotional compensation come on! My heart breaks to think about all the un necessary purchases that have gone to waste. When you are young you have a mentally that more is better but when you hit your late 20’s like me (getting old) I prefer to have one expensive white T then 17 that will fall apart in one wash.. sound familiar!! Lets get you making money and de cluttering!! BREATH! Firstly– I went through each item. (YES its going to get overwhelming) Light a candle and play your favourite CD. The next step I took was Ebay. Ebay is a great website to sell anything from clothing to shoes to jewellery-your trash is always someone else treasure. I like to start items at 0.99 cents with a good description. Ebay is an auction so highest winner will win the listed item. Try bulk buy or Buy it now. Its easy to create a account! TIP – Upload a photo of you wearing the item. You can crop your face out if you don’t want to show it. Its more appealing to the buyer. Gumtree is another similar website to Ebay more for your local community though. There is a huge listing of items. Worth a look. I also went to Camberwell Markets, Melbourne with two other girlfriends. You have to book in advance. We were lucky enough to make a few hundred from our unwanted items. Keep in mind people will barter! Everything else that did not sell we decided to take to a charity bin. When it comes to clothing so many of us like myself hold on to memories. Unless its designer I won’t let it go. But for all your other day to day wear I think its important to de clutter and let items go. There is a little saying ‘’ if you haven’t worn it in a year get rid of it’’ and its true!